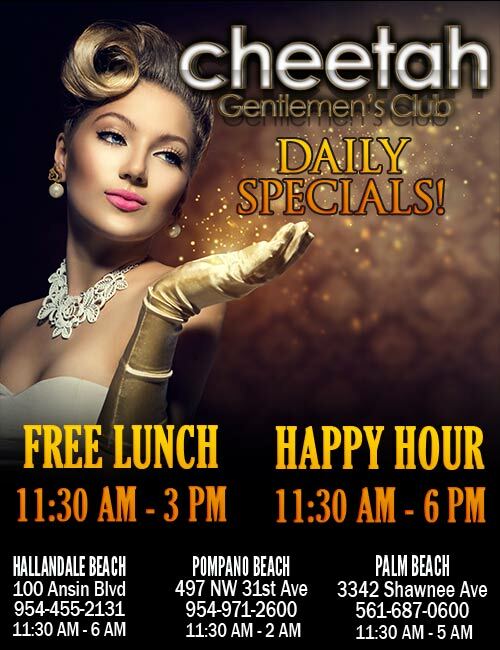 Cheetah’s COMPLIMENTARY gourmet lunch daily from 11:30am-3pm! « The Cheetah Bowl – Big Game Watch Party! We offer a COMPLIMENTARY gourmet lunch menu daily 7 days a week from 11:30am-3pm & Happy Hour specials till 6pm . This isn’t your typical free lunch. Come see for yourself what we mean by a COMPLIMENTARY lunch! You’ll be pleasantly surprised and satisfied! Our lunch menu includes sandwiches, salads, pastas, wings, burgers, and more. Plus, you get to enjoy a spectacular show with the hottest adult entertainers in South Florida.